JH and I had scouted the owls on 1/18 from about 4:45 to 9:00. On that night, the spider burrow by the sag pond was closed. The lower sag pond was dry, and the black silt that is usually under water was dry. At dusk, Northern Saw-whet Owls began to toot around 6:35. Usually we wouldn’t expect that, Northern Pygmy Owl instead, but we heard none of those on either night. The saw-whets also wailed, and we heard Western Screech-owl. and squeaks and wails here. This recording was originally 3:43 minutes, and has been edited to remove some of the dead air. The three toots are not from a live owl. We went a short way down the Stevens Creek Nature Trail, and I found one millipede (probably Xystocheir dissecta) under UV. We had discovered (with the help of a scientist on an excursion to a different preserve) that these particular millipedes continue to emit light for a few seconds after removing the light source, when the UV flashlight is held close to the millipede for a slow count of 3. Also, three forest scorpions were visible, and one was completely out. Other birds that we saw or heard included American Robin, Oak Titmouse, Nuttall’s Woodpecker, a thrush, Dark-eyed Junco, Spotted Towhee. A couple of camel crickets were out, and a few crickets chirped. One black beetle walked around. The temperature was unusually warm; at 8:00, 64F at the station that I use as a standard. Some places were a little chilly, and on the last stretch of trail I had to remove my jacket, as there was a warm breeze. I joined KD and JH on 1/25/14 on the public night hike, along with KG. We met at 3:15 and finished around 8:30. Another of the syrphid flies that are everywhere now and interested in us, checked me out and landed on my hand. An American Kestrel called. I found an orb with what appeared to be a Cyclosa, but without a trashline. 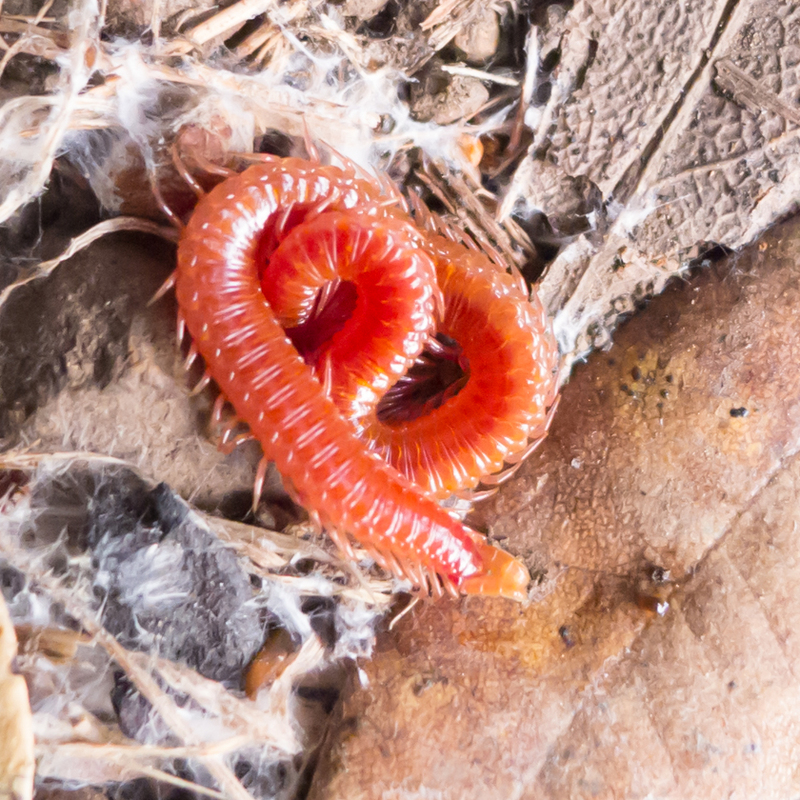 Under a log, a small red centipede laid curled up. At our dinner spot, KG spotted a large, high bird in the distance–a Golden Eagle! As we watched the bird soar, a Peregrine Falcon flew over. It was unusual to see both of these birds at the same time, and at dusk. Plus, we haven’t seen them at that particular spot before. A Red-tailed Hawk also flew over. Acorn Woodpeckers vocalized. Other birds included Chestnut-backed Chickadee, Spotted Towhee, American Robin, Nuttall’s Woodpecker, and a “dairy” (Downy or Hairy) woodpecker. In contrast to the earlier week, we had to work hard for Northern Saw-whet Owls. We heard some distant toots, and one wail. Instead of screech-owls, we heard Great Horned Owls. We returned to the open intersection after dark. Surprisingly, a squirrel yelled at something for at least a few minutes. On the way up the hill, some participants found two scorpions. 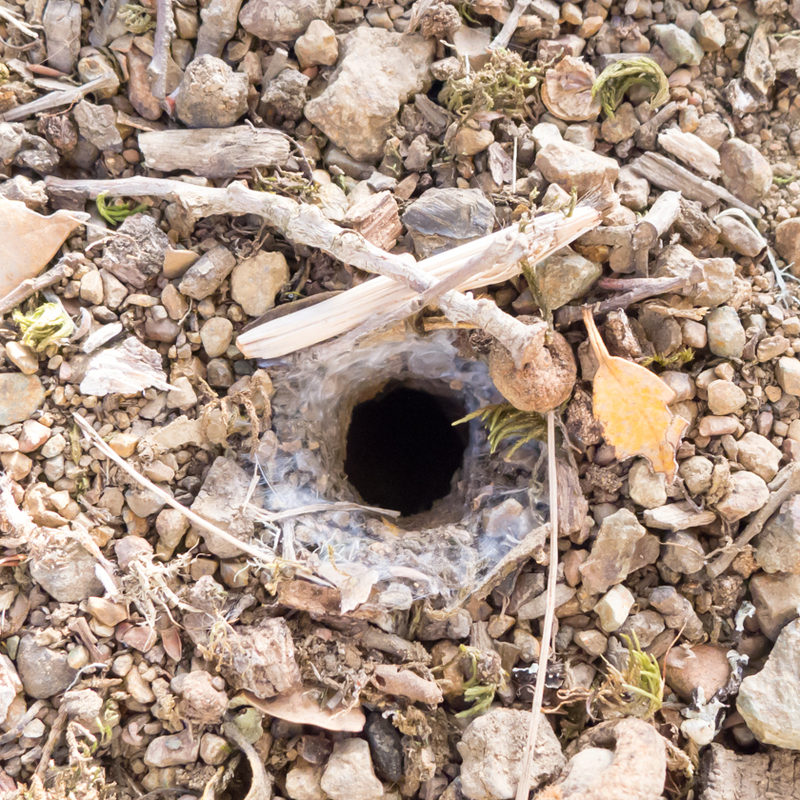 The spider hole at the sag pond was open, and some participants were curious enough to look inside. At 8:00, it was 62F. As with our previous trip, there were cool and warmer spots. 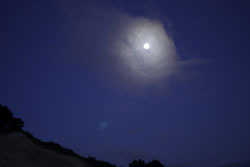 The sky was clear, and when we arrived back, astronomers viewed the sky from the lot. Note that permits are required for access to the preserve after closing, and two docents must be with you.